Does My DSLR Have Dead Pixels? A few months ago I took a few test shots with my old DSLR to show my father (who was going to inherit it from me when I got a newer one.) It wasn't very bright out (or inside, for that matter) so I plonked it down on a table, put it on a self-timer and a 20 second exposure to get a decent image without a million ISO. With horror, I discovered that it seemed to have several rather badly broken pixels. Fast-forward a couple of months and I have a new tripod which I'm playing with. As I do some night shots from my balcony, I discover that even my newer camera seems to have a few dead pixels! I just hadn't noticed them before. Oh, the agony. Well, as I quickly learned, that's just the kind of noise you get with long exposures. The sensor heats up as it is being used to collect light, and eventually the heat will cause a few pixels to flip here and there. All cameras suffer from this, and it does not mean the camera is broken. It's part of taking long exposures. Someone almost rhetorically asked, "I wonder how much ambient temperature affects this." Of course, living in a cold climate and it being winter, I couldn't resist conducting the experiment. For science! 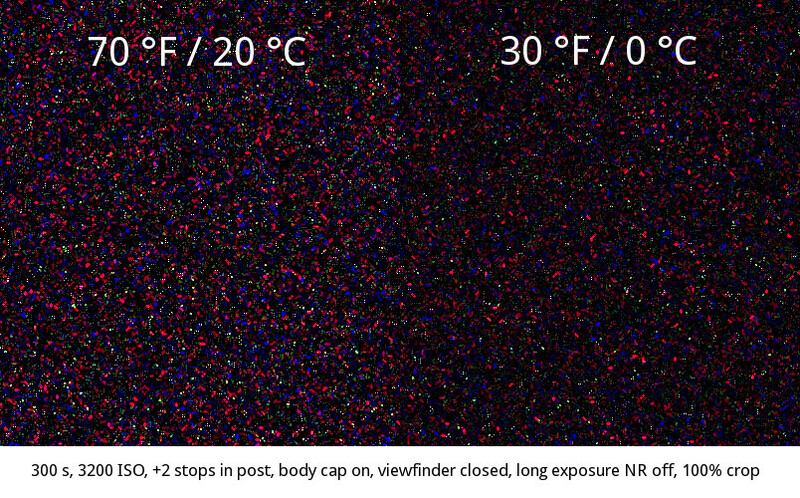 As the picture above quite clearly shows, ambient temperature definitely plays an important role in the amount of noise from long exposures. The two pictures were shot at five minutes exposure time (in bulb mode with a stopwatch and my finger on the shutter release button because I haven't figured out shooting tethered to my computer yet) and have had the exposure boosted in post to show the difference more clearly. Despite having both the biggest holes in my camera closed, I did get some light leaking into one corner of the image, but the crops are from the least exposed parts of the image. What I find kinda cool, even though it probably should be obvious, is that this is yet another sign of how limited our cameras really are. We could wish they would only record light, but as it turns out they record heat as well, and there's not much we can do about it. We have to figure out ways to deal with it and create good pictures despite that imperfection. Update 2015-04-20: Turns out the "light leak" I saw was not actually a light leak, but amp glow.